YUKO GORDON won county gold in the VW65 category, finishing in 22 mins 44 secs to take the medal. She was joined on the county podium by CATHY CRAIG who took bronze in the same category in a season’s best of 28:28. CALLUM STEWART was 3rd in the open race in 16:15 and ANDREW PATTERSON 7th in a year’s best time of 16:40. Conditions were very blustery and with the quick runners stating that the course was running 15 to 20 seconds slower than Race 1 a fortnight earlier Andrew will have been gutted to miss a PB by a single second. KEN JUDE was fourth Spartan finisher in a year’s best time of 23:15, and there was also a year’s best of 26:33 for PAUL HOLGATE. The Spartans women’s Masters Track and Field team were bronze medal winners in the EMAC Final in Milton Keynes. The defending champions were just one point behind silver medalists Royston. Milton Keynes took the trophy. A full report will follow next week. NATALIE LAWRENCE was second woman to finish in the Hull Marathon on 3:05:12 but was unfortunately sent the wrong way by a marshal as she approached the stadium at the finish, costing her around 3 minutes as she tried to find the entrance to the stadium. ADRIAN BUSOLINI was in Germany to run in the Seenland Marathon. He completed in a time of 3:35:56, smashing his personal best by other 30 minutes. Four Spartan women ran in the St Paul’s Walden Bury 10k race, which was off-road, muddy, hilly and a nice taster ahead of the forthcoming cross-country season. ISABEL GREEN was quickest Spartan, and 5th woman, in 48:35. KAREN PALMER was 20th woman in 59:42 with CAROLE SHELDRICK close behind in 59:46. CAROLINE CROFT ran 1:01:28. ROGER BIGGS was in Leighton Buzzard for the annual 10 mile event. It rained for the entire event, and got quite cold on equinox day. Not one of Roger’s better days, but he was glad to get over the finish line in 1:57:10. It was Roger’s 1800th running event, made up of exactly 900 marathons, and 900 everything else. DAVID BOWKER ran in the VAC 10k Championships at the Millenium Arena in Battersea Park. He finished 4th in the M60 category in a time of 43:26. THOMAS SAUKA ran the Harvest Trail Half Marathon the weekend before, finishing 44th in 1:54:10. He was joined there by SOPHOCLES GEORGIOU. Sophocles reported the event as by far the hardest he has done with lots of trip hazards through the woods above Royston Heath. Thomas survived a fall over one of the tree roots before continuing on to his creditable finish. Also the weekend before, YUKO GORDON ran the marathon at Rutland Water. With 281 finishers from 460 entrants, who were joined by a further 1400 or so taking the half marathon option. This low key event is characterised by stunning views, for which participants must pay over the steep climbs and descents, uneven gravelly paths and strong headwinds on flat, exposed areas. Yuko enjoyed the experience, finishing in 3:56:09, and will return again in future years (although not next as she is intending to run Berlin which clashes). This week’s Parkrun events saw Fairlands Valley Spartans’ posting results from as far afield as Capalaba, Australia. While closer to home PB results were recorded for JAMES MCSWEENEY in 23 mins and 12 secs and PAUL JENNINGS in 27 mins and 49 secs at the Stevenage event, for Tim ROBINSON in 24 mins at the Groveland run, and for BARRY KING at Wimpole estate in 24 mins and 45 secs. DANNY SCANLON was 5th overall in a time of 19 mins and 19 secs alongside VERITY FISHER who was the 9th woman to finish in 24 mins and 49 secs and CHRIS HOLLAND who ran 24 mins and 28 secs at his 70th Parkrun in Stevenage. 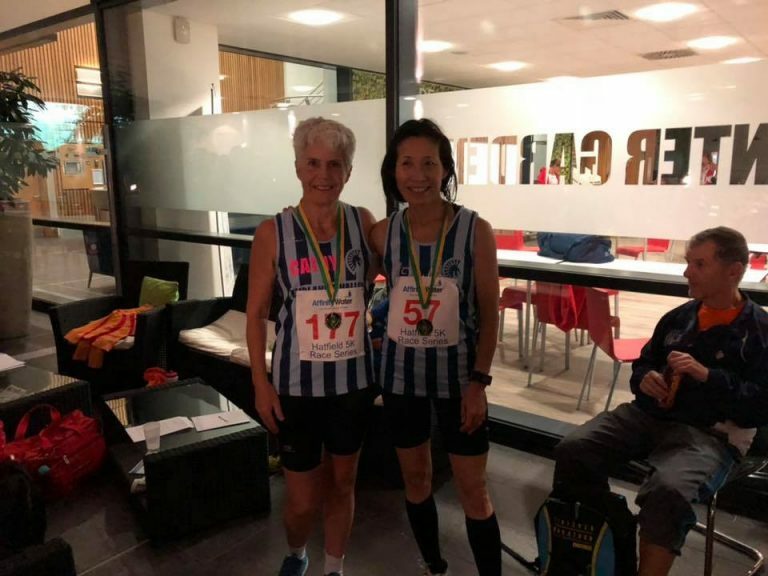 At the same event CATHERINE CRAIG and HAZEL SMITH finished their 20th and 30th events in 56 mins and 22 secs and 56 mins and 23 secs, respectively. First time runs at new locations saw KEN JUDE finish the Heartwood Forest run in 24 mins and 31 secs alongside JOHN ROXBOROUGH in 22 mins and 05 secs, SHERYL HANN the Ashton Court event in 30 mins and 19 secs, JIM BROWN and PENNY SCHENKEL complete in 31 mins and 32 secs and 31 mins and 33 secs respectively in Capalaba, Australia, MICHELLE MARCHANG run St Albans in 31 mins and 53 secs, and DARRYL STEVENS complete the Mile End run in 39 mins and 48 secs. In Stevenage, KERSTIN WEINER was the 27th woman to finish in a time of 28 mins and 39 secs, MATTHEW PATTMAN the 30th man in 22 mins and 51 secs, SALLY PHILLIPS the 34th woman in 29 mins and 48 secs, and TRACY STILES the 40th woman in 30 mins and 55 secs. Followed by DANIEL SUTTON, JAMES SOUTH, CRAIG BACON, MICHAEL O’KEEFE, and DAVE SMITH and DAVID SCOTT all in the top 100 men with times of 25 mins and 04 secs, 25 mins and 19 secs, 25 mins and 22 secs, 26 mins and 03 secs, 26 mins and 35 secs respectively. ROGER BIGGS completed the event in 31 mins and 53 secs and STEVEN DOBNER in 35 mins and 43 secs. (See the end of this release for all Saturday’s Spartan Parkrun results). Grovelands 59 52 Tim ROBINSON 0:24:00 PB! 40 37 James MCSWEENEY 0:23:12 PB! 138 117 Paul JENNINGS 0:27:49 PB! Wimpole Estate 94 84 Barry KING 0:25:45 PB!